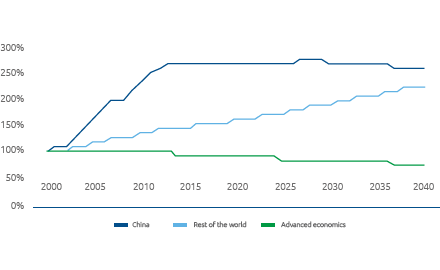 Future scenarios see the economic and population growth of the emerging countries as the main factors driving the world’s energy demand, and of which China, India and other Asian countries will absorb around 80% of the increase expected by 2040.In this context, natural gas will continue to play a leading role in the evolution of the energy mix, albeit with different roles in different geographical areas. 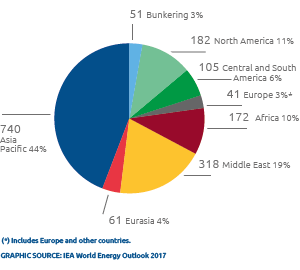 If, in fact, natural gas in non-OECD countries is mainly responsible for supporting economic development by integrating coal and oil, in Europe and in Italy, where it already has a significant presence in the energy mix, it can help guarantee the progressive decarbonisation of the economic and social system, together with non-programmable renewable sources such as wind and photovoltaics. 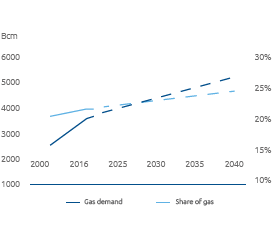 Natural gas will be an increasingly accessible energy source, given the presence of considerable reserves in areas close to Europe and the growth of the worldwide liquefied natural gas market, which has increased availability at reduced prices. In this context, the network of existing infrastructures for transport, storage and distribution, and those under development and construction, will make Italy the European gas hub, guaranteeing the energy system flexibility, programmability and affordability. This is also due to a gas electrical generation capacity which in Italy is already widely available and extremely efficient.